Episode5 Segment 5 - How do I keep up with my school work? It is important to have people at school that can help you manage your pain and school work, especially if you are stressed or anxious. Identify a key support person at school to contact if there are changes to discuss, when feeling concerned, stressed or anxious. Remember to speak up and ask for help. Teachers will not necessarily know about your pain or be able help you unless you communicate with them. Being organised with your time is important for all students, but especially if you have pain. Setting up routines and planning for the day and week at school and at home are an important way to manage your time and your pain. Being organised really helps reduce stress and creates more time for fun things to fit into your day too. 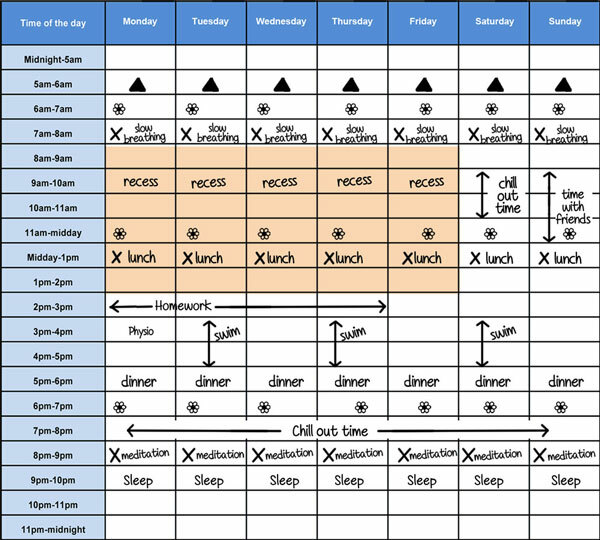 Read the example table provided with possible timetable examples and code list provided. It might help you to develop your own timetable. The purpose of this activity is to help you identify how pain can affect your day, then after looking at an example of a timetable, you can write your own timetable. Read the following questions and type your answers into the box. The answers should help you decide what to write in your timetable. Have a look at the example diary page below. Read the example timetable provided with possible timetable examples and code list provided. Fill in your own schedule using the blank timetable provided and print it out, or you can print a blank copy to fill in. Before you make a timetable it is important to identify how pain can affect your day. What activities make your pain worse? What activities make your pain better? When do you have physical education or sport scheduled? How much moving around is needed each day? How much sitting time is there each day? What do you do to have fun and reward yourself? Have a look at the timetable example below for some ideas of how to do one for yourself. Choose a symbol, enter your own label, select a color and click 'Add'. Now fill in your own timetable for each week, then revise it (good to get help with this from parents / friends, so don't plan to do too much). You might find you need to drop a few things, or add in others. Read more to find out other suggestions that can help you plan your day. Listed below is a day-by-day routine. Use a phone or diary to record all your activities. Each morning, look at your diary. Do you have all the books and supplies for your pain management that you need for the day? Before you leave for school, make sure you have everything you need for the day. Lunch? PE clothes? Anything else? At school, look at your diary throughout the day. What events are on? What things are due? Where do you need to be? Remember to write down your homework and due dates. Before you leave school, check your homework diary. Have you written down all of your homework tasks? Do you have all the books you need? homework? At home, do your homework and make sure to pack it in your bag. Each night, look at your timetable. Pack your bag the night before with the right books and supplies. Transcript: Segment 5 - How do I keep up with my school work? Initially when you go back to school it's really important to focus on the fact that you are at school rather than where you're at with your learning. It's quite common to fall behind, we don't want you to worry about that initially. You can catch up later and that's where your key support person comes into play. So when you go back to school it's really important to identify a key person within your school that you can go to and they should be aware of your pain. Whether that be your school counsellor, your year advisor or a particular teacher that you have a good relationship with. They might be able to help you with some strategies that you might have in place and to utilise those strategies within class. Um… once the student is at school we would normally make sure there's an aide within distance of him. A lot of the children don't like having someone chaperoning them so it's quite a delicate and professional thing to have someone close nearby keeping an eye on him. And we have to develop a dialogue between the students and the teachers. So the student has to be able to- and particularly the older students um… we have to give them a chance to talk to us and we have to ask them questions. The younger the students are we can only go off what we see visually. Rubbing of the hands, sitting down, trying to find their own quiet space and things like that. So it's very important that we get feedback from- 'caus it is their body. It is that we're talking about. It's their pain that they have to manage. The teachers aides, um… they'd like - if I wasn't - like, I'd struggle like obviously with my school work because I'm all foggy in the head or if I wasn't there. You miss things, you don't pick up- it's hard when- and then you're like falling behind everyone and then you feel dumb because everyone else is, like, ahead of you and then having a teachers aide who can like sit with you and help you. Like it gets through your head a lot easier and better. And that helped a lot having a teachers aide to help with like, It's like having your own personal teacher. You kind of build like a special bond with them because you're with them so often. And you can like like, I I remember one of my teachers aides was really really helpful. Like I'd come to her if I was having a bad day or if someone was picking on me, I know I could go to her for anything. And it made things so much easier. One of the things that really helped me get through school was having a great support base whilst I was there. My Head of middle school was fantastic in helping me get through each day and checking up on me every day. I had some great friends that were there to help me and really support me through this tough time at school. And my physio was also really supportive, coming in and talking to my peers in my young year group, just explaining to them what was going on and helping them to realise that what I was going through was real and that it was something thats very hard to understand. But something that was gunna be there for the rest of the year. But they were really supportive with me. Having a routine or a timetable is really important to have, not only for school but for home purposes as well. So by putting your extra curricular activities into it. But most importantly putting your pain management strategies and your relaxation time within your routine is important as well. Your routine or your timetable can help you worry less and can help you feel more organised, which then reduces any stress that may come if you didn't have that timetable. So if you worry less and if you stress less then you'll generally have less pain. Being well organised was probably essential throughout my whole year because of how busy life was in terms of appointments and school work and everything else. So we were very fortunate that I was able to set up on my lap top a good spreadsheet that told me what I had to have done for that whole week and I was just checking things off as I went and it was very logical and methodical and I knew that at the end of that week that I just had to make sure that I got things done and I used the weekend just to rest or finish off last bits of work that I needed to. Time management was just an essential skill and something that I developed over the course of that year. It's gotten a lot easier now that I'm back at school, I'm going full days. I am more organised, um… because I am doing full days and school starts early so if I ha- I make sure everything is ready the night before. So I get up and do get dressed, pack my bag, do my meds and off to school. So everything is set out and I'm not under pressure to get ready. There's a great saying which I love which is "You've gotta have work/ life balance in life.